One hundred years ago, oranges and bananas were considered rare, novelty foods because they had to be shipped from faraway locales. Today, they’re commonplace, but there are plenty of other fruits that are unusual, odd, and downright weird. 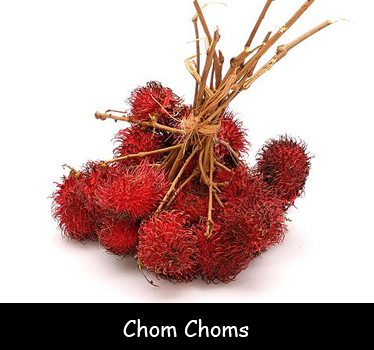 Chom choms are bright red like a strawberry on the outside, with green and red furry spikes. Peel back this unusual peel and you’ll find a juicy white interior. Durian looks a little like a nut on the outside. It has a brown, spiky peel and a strong, pungent smell. Some people like the smell; others can’t stand it. The fruit is creamy yellow and sweet. Inside a thick, deep red shell is the mangosteen fruit, perfectly white and both sweet and tart. Longan has a yellowish-brown peel. Inside, the fruit is translucent white with a brown center. It looks a bit creepy, but it tastes delicious. Persimmons grow on trees in warm regions, such as Texas. They’re bright orange and shiny, and almost look like tomatoes. Their flesh is sweet and firm. As it ripens, it becomes soft—almost like eating pudding. Sapodilla has a brown furry peel—similar to a kiwi. The flesh inside is yellowish brown and super sweet. Its taste has been described as similar to a caramelized pear. Jackfruit grows on trees and can reach up to 80 pounds! This enormous fruit has a thick, tough bumpy shell. Inside, the fruit is yellow and slightly sweet. Jackfruit is used in both sweet and savory dishes. Dragon fruit might be the most beautiful fruit on the planet. Outside, it has layers of fuschia leaves—similar to an artichoke—that are tipped with green. Inside, the fruit is white with black freckles. Dragon fruit has a creamy texture and a sweet-tart flavor. It’s the national fruit of Vietnam. Star fruits have thin, edible skins and sweet, firm flesh. Their most charming quality, though, is that, when cut, they are shaped exactly like a star. Pomelos are huge green cousins of the grapefruit. Their thick skins give way to sweet, pink flesh. Guavas are beautiful fruits with their green skins, pink fruit, and sweet, refreshing flavor. Kumquats aren’t in season very long, so try them when you see them. They’re like tiny oranges with edible skins. Question: Where can I find these fruits?